Posted on March 15, 2019 at 5:04 pm. 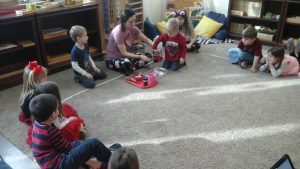 Welcome to Science in the month of February! Mr. John worked with us on some very exciting new science experiments. 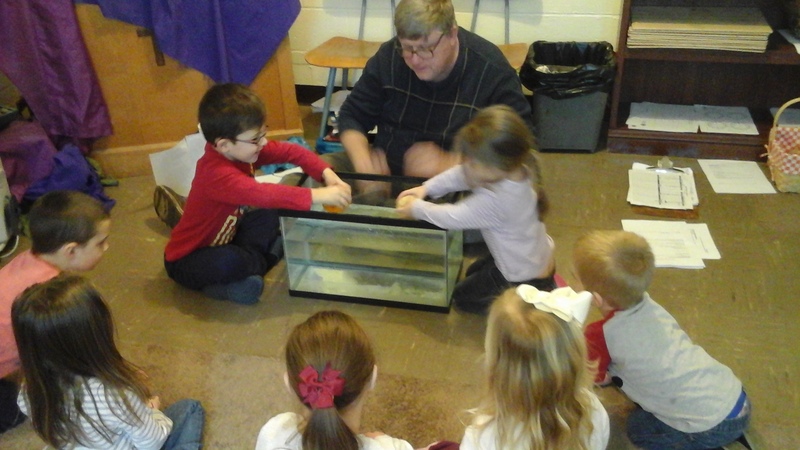 At the beginning of each science experiment, Mr. John has us come up with our own hypothesis. A hypothesis is an educated guess. Mr. John always tells us that it never matters if our hypothesis is right or wrong, because scientists sometimes are wrong too. We can be just like scientists and learn what works and what doesn’t work. Don’t forget to check your student’s science paper in their folder every Thursday to see what their hypothesis was for that week’s experiment! Question of the week: What will happen when we mix oil, water, and alka seltzer? Our data: When Mr. John mixed the oil, water, alka seltzer, and food coloring together, the food coloring floated as if it were a lava lamp. But why did the food coloring float?………SCIENCE! The oil stays above the water because the oil is lighter than the water or, more specifically, less dense than water. The oil and water do not mix because of something called “intermolecular polarity.” Molecular polarity basically means that water molecules are attracted to other water molecules. They get along fine, and can loosely bond together (drops). This is similar to magnets that are attracted to each other. Oil molecules are attracted to other oil molecules, they get along fine as well. But the structures of the two molecules do not allow them to bond together. 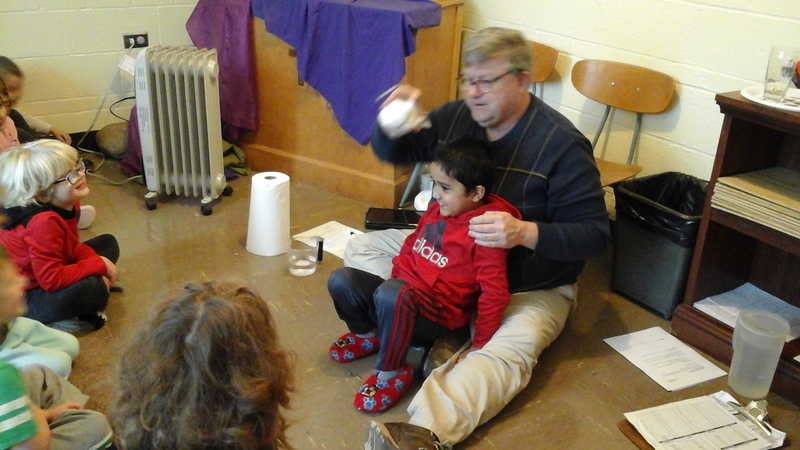 When Mr. John added the tablet of alka seltzer, it sank to the bottom and started dissolving and creating a gas. As the gas bubbles rose, they took some of the colored water with them. When the blob of water reached the top, the gas escaped and down went the water. Cool, huh? By the way, you can store your “Blobs In A Bottle” with the cap on, and then anytime you want to bring it back to life, just add another tablet. 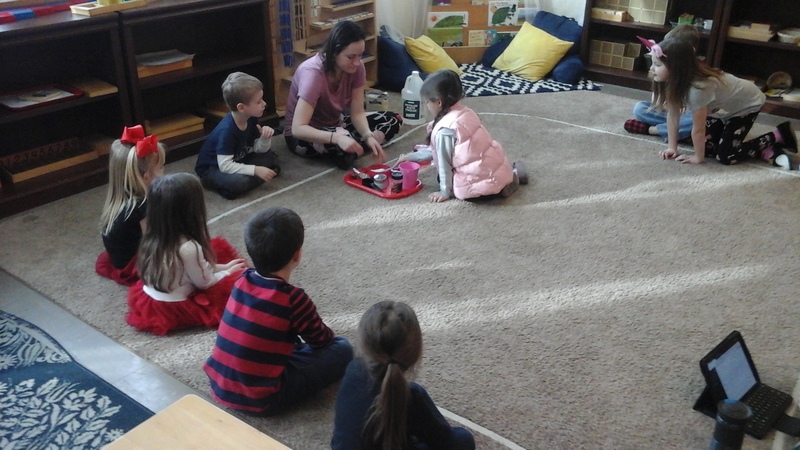 This week Ms. Ashlie filled in for Mr. John, and showed us a fun volcano science experiment! 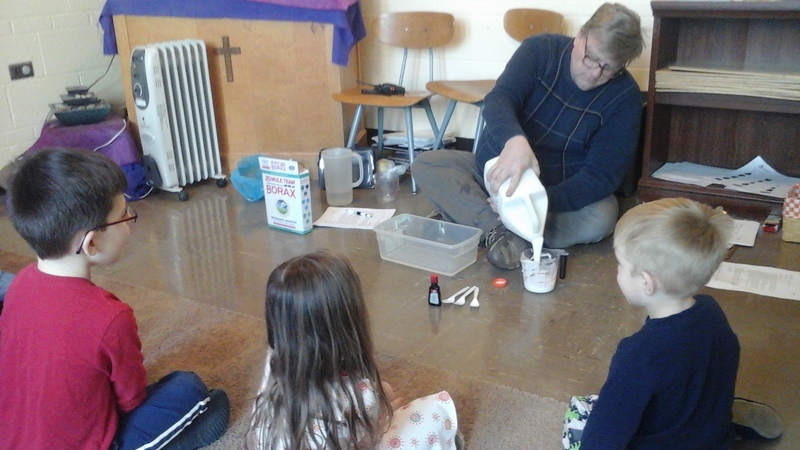 Question of the week: What will happen when we add baking soda to white vinegar? Our data: When Ms. Ashlie added the baking soda to the vinegar, it began to bubble over the side of the container just like a volcano! 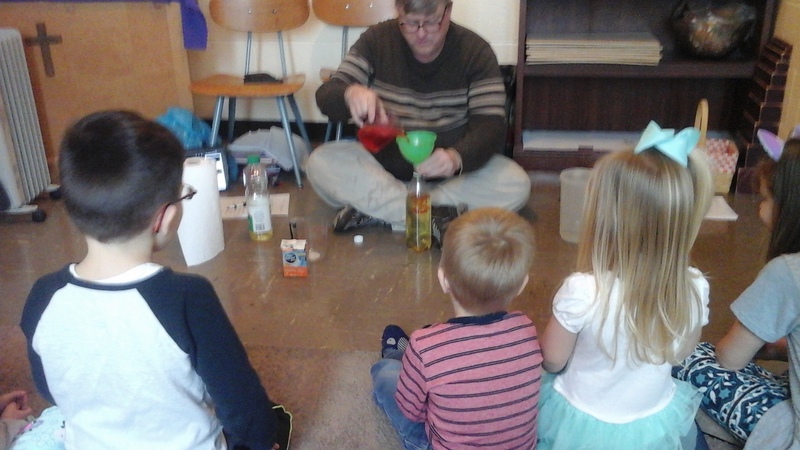 But why did the vinegar begin to bubble?…….SCIENCE! Just like in a volcano, the lava starts to build and build until it begins to overflow! We call this a chemical reaction. Thank you, Ms. Ashlie, for such a fun science experiment this week! Question of the week: What are the bubbles in the soda? What will happen when we put raisins in a fresh glass of ginger ale? Our data: When Mr. John dropped several raisins into a glass of ginger ale, the raisins sunk to the bottom. The after a few moments the raisins were covered with bubbles and raised to the top, then fell to the bottom. This repeated for a several minutes. But why did the raisins bubble up to the top and then fall back down to the bottom?….SCIENCE! The raisins are heavier than the ginger ale. Then the carbonated bubbles attach themselves to the raisins. When enough bubbles attach themselves to the raisins the raisins become “lighter” than the ginger ale. The carbonated bubbles lift the raisins to the top. When the bubbles reach the surface the bubbles break dropping the raisins to the bottom again. 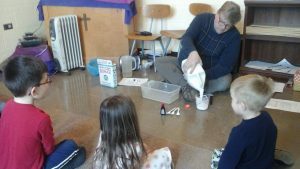 Question of the week: What will happen if we mix Borax, Elmer’s glue, and water? 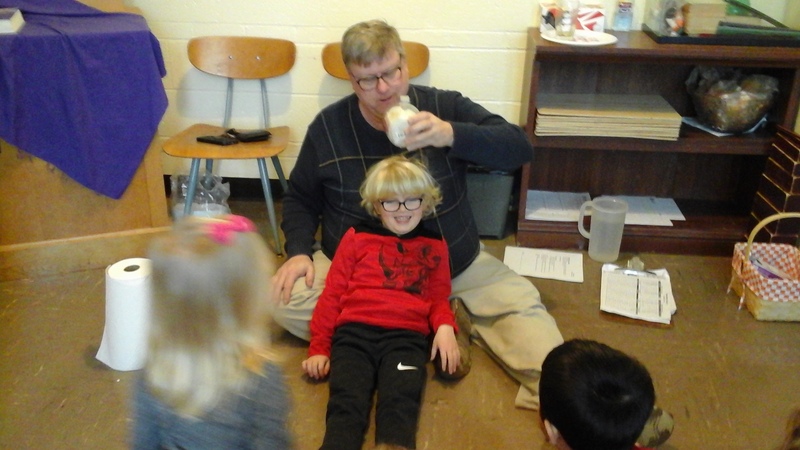 Our data: When Mr. John mixed the ingredients together, it became silly putty. But why did the ingredients turn into silly putty?……..SCIENCE! Borax is the compound that is responsible for hooking the glue’s molecules together to form the putty-like material. There are several different methods for making this putty-like material. Some recipes call for liquid starch instead of Borax soap. Either way, when you make this homemade silly putty you are learning about some of the properties of polymers. We had so much fun in science this month! Thank you, Mr. John! Posted on January 28, 2019 at 7:08 pm. Welcome to the first month of science in 2019! 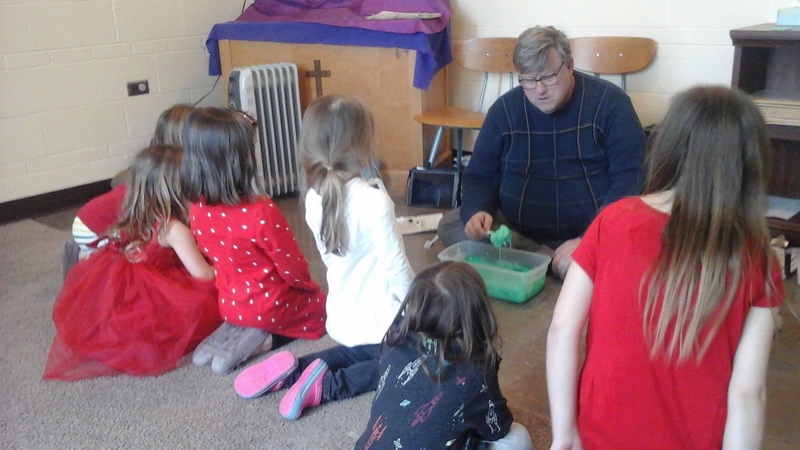 Mr. John worked with us on some very exciting new science experiments. Question of the week: What will happen if we light a piece of paper on fire inside a glass, turn it upside down, and place it on a plate? Our data: When Mr. John lifted the glass, the plate was stuck to it and also lifted. But why did the plate get stuck to the glass? SCIENCE! When the piece of paper inside of the overturned jar is lit, the air inside the jar heated, causing it to expand. When the flaming paper is extinguished, the air inside the jar cools and contracts, leaving a void of air within the jar. 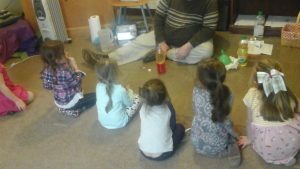 We created an imperfect vacuum! Question of the week: What will happen if we pour water in a container containing paper towels and another container containing Sodium Polyacrylate (the stuff in diapers)? Which will hold more water, paper towels or Sodium Polyacrylate? 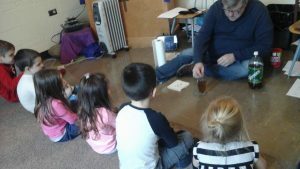 Our data: When Mr. John poured water into the container with the paper towels, the paper towels absorbed some water, and some of the water spilled out of the container. 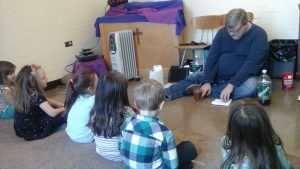 When Mr. John poured water into the container with the Sodium Polyacrylate, it absorbed all of the water, and none of the water spilled out of the container. The Sodium Polyacrylate holds more water than the paper towels, therefore it is more absorbent. Question of the week: What will happen if we put a crumpled piece of paper in a glass of plain water and a crumpled piece of paper in a glass with dish soap? 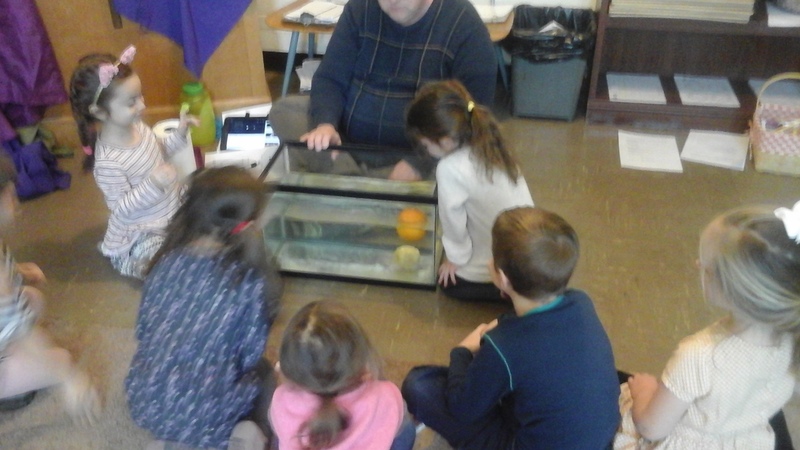 Our data: When Mr. John dropped a crumpled piece of paper into the glass with plain water, it floated. When Mr. John dropped the crumpled piece of paper in the glass with dish soap and water, it sank. Water molecules are strongly attracted to each other and this gives water a high surface tension. The surface of water is strong enough to hold up light-weight objects such as paper. Dish soap mixes with water molecules, lowers the surface tension, the hydrogen bonds are weakened or destroyed and the paper sinks. The paper in the glass floats because the hydrogen bonds are intact. 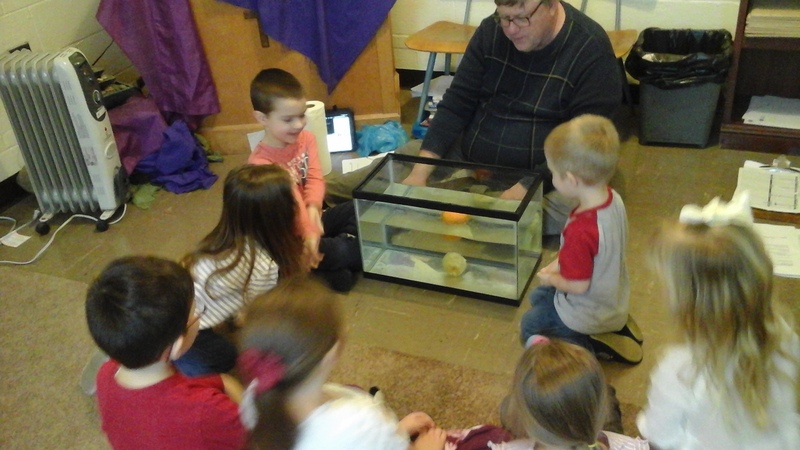 Question of the week: What will happen if we put a peeled orange and an unpeeled orange in water? Our data: When Mr. John dropped the oranges in the water, the orange with the peel on floated and the orange without the peel sank. The unpeeled orange may be heavier, BUT there is air trapped by the peel making the orange float. The peeled orange has no air so it sinks.